The question is critical for any change agent, according to Godin, and the two answers should lead to very different approaches. What lessons can we, as physical activity advocates, draw from this framework of behavior change strategy? Most of us do not hold marketing degrees, but we are quite clearly attempting to “market” physical activity in some way. Are most physical activity promotions tailored and targeted to a specific audience (including an audience of 1) or do they tend to be more generalized? Physical activity is notoriously difficult to promote and market. Unlike, say, the soft drink industry, whose marketers compete to sell the highest quantity of a product coveted all over the world for its instant gratification, the marketers of physical activity have to first convince their audience to try the product and actually exert some discomforting effort. Consequently, the percentage of Americans who are physically active has remained relatively constant (and low) for several years, despite a steady flow of research and media stories proclaiming the benefits of exercise. We need to improve our marketing. General messages about the benefits of physical activity aren’t good enough at the individual level. There are over 300 million people living in America and they each have an internal story about who they are, what they do, and why they do it. Convincing an individual to be active often requires a marketer to understand that individual’s internal story: hopes, fears, aspirations, etc. It takes time and the outcome is always in doubt. It’s much easier to market soft drinks. At the cultural level, I am hopeful that some current physical activity marketing campaigns will have a long-term impact. 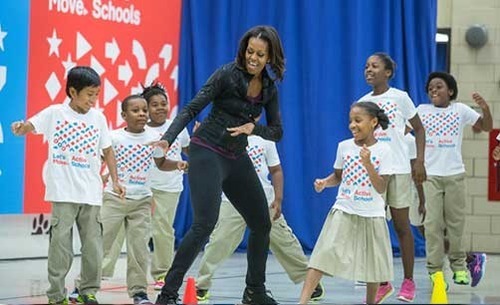 The First Lady’s “Let’s Move” campaign, for example, is infused with a collective, “we can do this together” spirit that feels, in this still early stage, like the beginning of a cultural shift about how we value physical activity (and having an extremely well known, popular, and physically active spokesperson is a nice bonus). Similarly, the “Designed To Move” campaign, championed by Nike and others, is helping to reshape how physical activity programs are delivered and promoted. But we are still waiting for the big, breakthrough campaign that fundamentally changes the culture from largely inactive to active. What will be the physical activity version of “Friends don’t let friends drink and drive,” “Give a hoot, don’t pollute,” and “Thank you for not smoking,” etc.? Those messages created and strengthened social norms: it’s not okay to let your friends drive drunk, it’s not okay to throw trash on the ground, and it’s not okay to make everyone around you smell like a cigarette. In America today, it is culturally okay to be sedentary. And it’s okay to remain quiet as a friend experiences deteriorating health due to inactivity. But should it be? Should we, as physical activity marketers, strive to make it not okay? What should we do?